kids, get mommys stripper boots out of the dress up box ! :facepalm: I can't believe I forgot The Thing and Blade Runner. I think specific genres are like the tide. They come into the mainstream for a little while then disappear and come back again. Sci-Fi had it's day in the sun during the late 70's and early 80's. It hasn't really come back into the main stream though. Fantasy and super hero flicks rule the box office now. Yeah, I agree here. Although I'd stretch it from the Late '60s to the Mid '80s. Have you seen Sunshine? Terrific modern science fiction film. Wait, Ax, you like heavier, distorted tracks? and my family has arrived. Chris Martin apparently thinks it's the best song ever or something. Chris Martin isn't a person. Oh god, how about when Ali said she saw Coldplay live. How about that! Okay people, let's talk about ugly shoes. 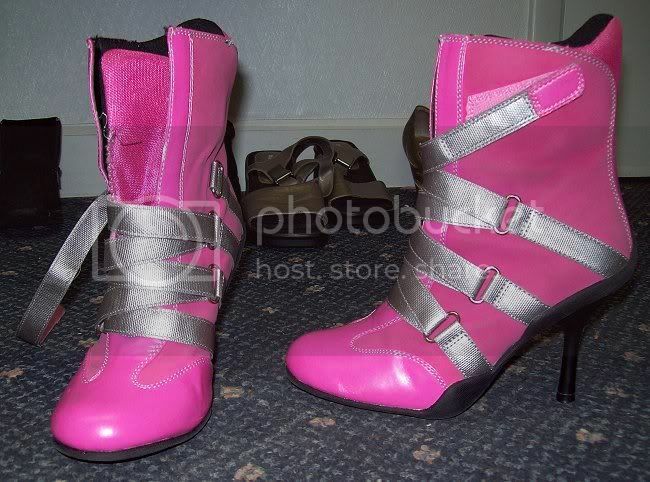 Bright pink stiletto heeled ankle boots, laced up with a wide silver strap, forming a velcro closure. CLASSY. For those posh nights at the trailer park. I think I actually made fun of her at the time for going to that gig. It's the shocking fact that just keeps on giving. Although i didn't think he'd kick it. Plus side: 2 competition points we didn't expect. Bye next week = two more points, then the dead last team at Mt Smart in two weeks time. In theory the three weeks should be worth six points. Niiice. Though you guys get points for a BYE? Wait....was that in bad taste? On "#9 Dream" right now, really liking the vibe of the second half. Putting a White Stripes track in the bounds of a "soundscape" could've collapsed the very fabric of Space-Time itself, but it didn't. Have you ever seen Metropolis? It will blow your mind to see how far ahead of its time it was. I have not seen Sunshine. I haven't seen a lot of movies from the last few years because I simply don't have the money to rent and see everything I want to. I know. I've never seen the point of it myself. It just artificially spaces the competition ladder out. Oooh, is it a charity gig? Or it's an American Psycho reference that went over almost everyone's heads? No bigs. Okay, now I'm really going. His solo career proves your point too. My mother was actually the Verve fan first. She loved Bittersweet Symphony and then heard a couple of other songs on the radio and bought Urban Hymns. She isn't so keen on the heavier, more distorted tracks, but I am. I would say "I suppose it's the only way the Rabbitohs will ever get any points", but I honestly don't know who the current shittiest team in the NRL is.